• Piston Clamp using a double threaded screw which doubles the pressure and speed and allows work on uneven surfaces, tubes, etc. • Rolled spring steel bar which gives maximum pressure held throughout the whole job. • Nodular cast iron jaws. CLAMP E-20 03020 PIHER CLAMP E-20 cm. ..
CLAMP E-15 03015 PIHER CLAMP E-15 cm. ..
CLAMP E-25 03025 PIHER CLAMP E-25 cm. ..
CLAMP E-30 03030 PIHER CLAMP E-30 cm. ..
CLAMP E-40 03040 PIHER CLAMP E-40 cm. ..
CLAMP E-50 03050 PIHER CLAMP E-50 cm. ..
CLAMP E-60 03060 PIHER CLAMP E-60 cm. ..
CLAMP F-30 04030 PIHER CLAMP F-30 cm. ..
CLAMP F-40 04040 PIHER CLAMP F-40 cm. ..
CLAMP F-50 04050 PIHER CLAMP F-50 cm. ..
CLAMP F-60 04060 PIHER CLAMP F-60 cm. ..
CLAMP F-80 04080 PIHER CLAMP F-80 cm. ..
CLAMP F-100 04100 PIHER CLAMP F-100 cm. ..
CLAMP R-30 05030 PIHER CLAMP R-30 cm. ..
CLAMP R-40 05040 PIHER CLAMP R-40 cm. 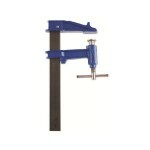 ..
CLAMP R-50 05050 PIHER CLAMP R-50 cm. ..
CLAMP R-60 05060 PIHER CLAMP R-60 cm. 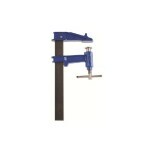 ..
CLAMP R-80 05080 PIHER CLAMP R-80 cm. ..
CLAMP R-100 05100 PIHER CLAMP R-100 cm. ..